SQL Server FAQ - Adding a New DSN with the ODBC Driver for SQL Server? Run Data Sources (ODBC). The ODBC Data Source Administrator window shows up. 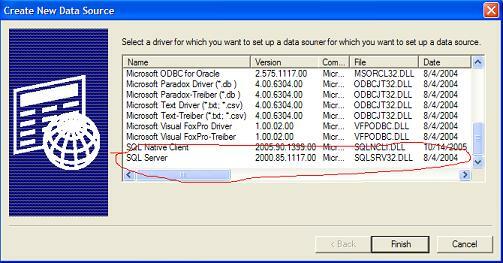 Select "SQL Server" from the ODBC driver list, and click "Finish" button. The "Create a New Data Source to SQL Server" wizard window shows up. Continue with the next tutorial to finish up creating a new DSN.